There are currently 29,424 users on this website. I was not very well off financially when the toonie was launched - but I think that this is the case with most 18/19 year olds. I remember all the news stories about the first batch of toonies wit the loose centre section, and how throwing one on the ground could make the centre pop out. I never came across one, and I seem to recall that the few that collectors were keeping them as-is with a loose centre were asking a mint for them... so I never got one. 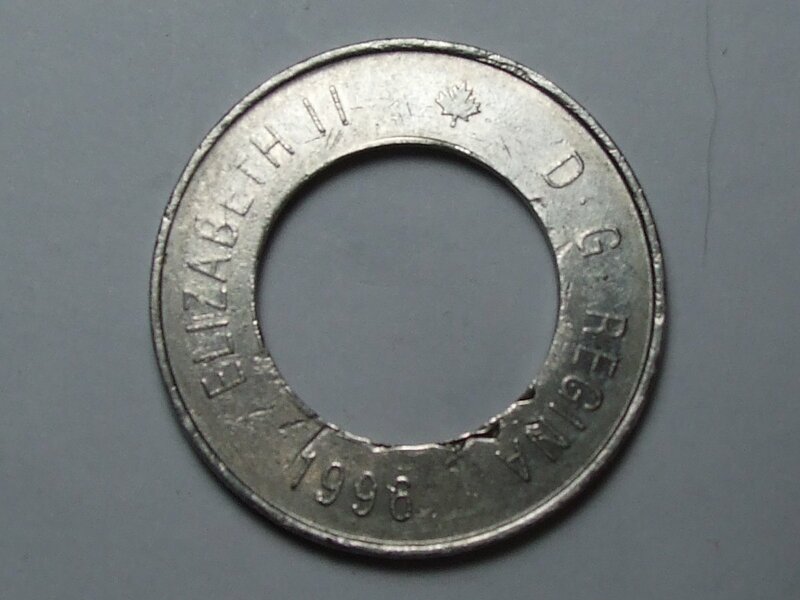 I am wondering, how many here still have a legit error 1996 toonie - not one that someone modified to pop out the centre. Time may have skewed my memory, but I seem to recall that much like an old 'Iron Cross' (old German war medal), you could shake one, and hear the centre rattling around. This coin is still on my radar as a "wanted" item, but just like many of the latter penny variants, vendors never seem have them. Do you not recall the issues with the first run? Your post seems to suggest you are unaware of it - and that this is only a PMD issue. I remember hearing news story that people were putting them in the freezer and then removing the core, but I never heard of the core rattling. There are examples of severe off struck inserts that are greater than a half moon, I believe a member here Zonad posted a pic a few years ago probably the largest one I've seen that still has the insert attached to the coin. I was too young to remember these come out but I do remember hearing that the centers of the first twoonies were easy to pop out. I dont think they had the technique of making the twoonie perfected like they do now. some of the issues with the first toonies were because they were from Germany and were 2 separate pieces that came together in the striking chamber. the striking pressure was what held it all together. the RCM toonies were already assembled when they entered the striking chamber thus eliminating the loose core issues. You can clearly see where damage occurred from punching out the centre. my bad for getting it wrong as stated by John100. It took 1.75 seconds to rattle this change.